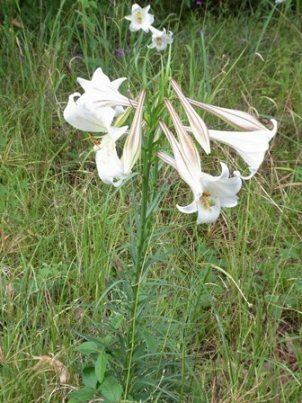 This plant has a very typical trumpet-shaped lily flower, white inside with a pink, purple or even brownish tinge on the outside. Flowers appear late summer. The flowering stems are erect and can reach from 1.2 to 1.8 metres in height. The leaves are alternate (but sometimes may be opposite or even whorled), on an unbranched reedy stem and are glossy, long and narrow. The above ground part of the plant is annual whereas the bulbs are perennial. These plants produce long cylindrical seed capsules (5-8 cm long) with flat disc-shaped seeds. The seeds are dropped over a period of time from the capsules around the plants. This keeps new plants close to the parent plant. Some may be washed further away with rain water picking up the seed and moving it or they may be moved in mud sticking to vehicle tyres. The Formosa lily has underground scaly bulbs and sometimes produces bulbils in the leaf axis, which also drop near the parent plant when the stems are moved by the wind. 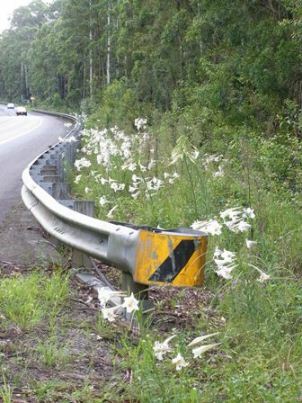 These plants are usually found on roadsides or at old dumping sites. May be confused with other lilies but generally the flower colour is a good indicator.